This article was originally published on The Huffington Post, May 4, 2015. The report is from the American Bird Conservancy and the neonicotinoids referred to are a relatively new class of insecticides that have become the most commonly used in the world, with several hundred products approved for use in the U.S. These “neonics” are neurotoxins that paralyze and eventually kill their victim. My organization, Center for Food Safety, has been working hard to halt the use of these neonics through litigation, legislation, grassroots advocacy, and legal petitions to the Environmental Protection Agency. We are suing to address the well-publicized threat that neonics present to the survival of honey bees and wild bees. At the time we launched our legal actions, I did not even know about the song birds. The anger-stirring realization that a song bird could be felled by a single seed and the prospect of bees being silenced forever brought me back to the words of Rachel Carson, written more than half a century ago in Silent Spring. “These… non selective chemicals have the power to kill every insect, the ‘good’ and the ‘bad,’ to still the songs of the birds and the leaping fish… they should not be called insecticides but biocides.” Through Carson’s crusade, biocides like DDT were eventually banned but new chemicals like neonicotinoids and other similar “systemic” insecticides/biocides have taken their place causing similar ecological havoc. Sadly, our regulatory agencies under the sway of the agrochemical industry have enabled this tragic and continuing environmental destruction. I think it is long past due that we who work in the food and environmental movement adopt Carson’s nomenclature. Let’s not refer to pesticides, whether they are insecticides, herbicides or fungicides, by anything but their real name: biocides. Words do matter. The “cide” ending in all these terms comes from the Latin caedare meaning “to kill.” Given that these chemicals are designed to kill that root word is accurate. But using the word pest-icide gives the impression that all these chemicals do is kill “pests,” whether insects, plant, or fungi pests. The neonicotinoids killing bees and song birds puts that delusion to rest. The bee is an insect but not a pest and the song bird is neither an insect nor a pest. But Carson only referred to insecticides as biocides. Is it fair to put all pesticides, including herbicides and fungicides, in the same pejorative etymological category? Well, let’s look at Monsanto’s Roundup. 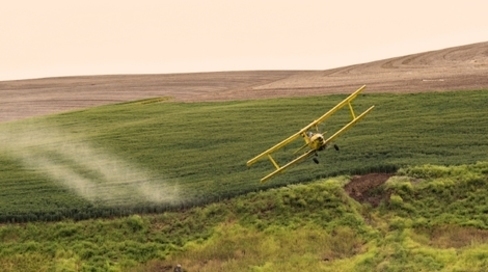 It is the most widely used herbicide in the world because of the adoption of genetically engineered (GE) crops designed to tolerate the chemical. Is Roundup just a pesticide, a careful killer of just those “bad” plants called weeds that farmers wish to remove? Of course not. Roundup does so much more than kill plant pests. It wipes out beneficial plants of all sorts: food crops, fruits in the orchard, flowers in the garden, in fact anything that is green. Most of these are not pests or weeds. Among the beneficial plants it destroys is milkweed, on which monarch butterflies depend. The massive use of Roundup in the U.S. has destroyed so much milkweed that monarch butterflies are now at risk of extinction. Monarch butterflies are not pests or weeds. Then there were the University of Pittsburgh researchers who a decade ago tested how Roundup might impact immature and mature frogs in ponds. This is how the researchers summarized their results: “The most striking result from the experiments was that a chemical designed to kill plants killed 98 percent of tad poles within three weeks and 79 percent of all frogs within one day.” That is very effective killing indeed, but of course frogs are not pests or weeds.Argentinian researchers using animal models then linked Roundup and its active ingredient glyphosate to cranial malformations and other birth defects long reported in the children of farm workers who were repeatedly exposed to the chemical. Infants are not pests or weeds. And then in March 2015, the World Health Organization’s (WHO’s) cancer authorities — the International Agency for Research on Cancer (IARC) — determined that glyphosate is “probably carcinogenic to humans” based on multiple lines of evidence: kidney, pancreatic and other tumors in glyphosate-treated test animals; epidemiology studies showing higher rates of cancer in farmers that used glyphosate; and research showing that glyphosate damages chromosomes, one mechanism by which cancer is induced. Overall, let’s contemplate what these biocides are bringing us: vast areas of this country stripped of all vegetation save for monocultured GE crops, devoid of flowers, bees, butterflies and song birds, with contaminated rivers and streams with little or no insect life, and fish and frogs and other aquatic life dead or deformed. Then there are the birth defects and cancers in our own children. What is the word that would encompass the result of our usingnearly a billion pounds of biocides each year? I would suggest it is nothing short of ecocide.